Send your congratulations to the ‘sposi’ with this luxury wicker hamper brimming with quality Italian products to fill their cupboards as well as gourmet treats! This is a wedding gift with a difference that they will remember long after they have savoured the last of the goodies! Organic Chianti Red Wine (750ml) 90/100 James Suckling (Outstanding: a wine of superior character and style). This is an organic Chianti produced from 100% Sangiovese grapes by the Tenuta San Vito Estate, in the beautiful rolling hills that surround Florence.This prestigious and popular Tuscan wine is a dark ruby red with an appealing fresh fruity bouquet. Full-bodied, round and harmonious in the mouth, matured in the bottle to harmonise and develop. Organic Prosecco Colfondo DOC (750cl) This wonderful organic, bio-dynamic, natural Prosecco has been made in the Veneto region of Italy with traditional farming techniques, completely organic viticulture and very low intervention. Forget fungicides, pesticides, herbicides on the vines, this wine is pure, kind to the planet and very possibly better for your health. Organic Extra Virgin Olive Oil (500ml) This is a very special and multi award winning extra virgin olive oil made from olives cultivated in Matera, Basilicata. It is full of flavour and very healthy. Perfect for drizzling on salads and bruschette and adding to all of your favourite Italian recipes. 2015 Winner 'Flos Olei' - Best Extra Virgin Olive Oil in the World for Quality/Price. 2014 Winner ‘JOOP’ the principal Olive Oil Prize in Japan, 2014 Gold Medal Winner ‘Biol’, 2014 Gold Medal Winner ‘Monocultival Olive Oil’, 2014 Second Place Premio Montiferru, Verona International Competition, 2014 Oil of the Year ‘Il Magnifico’ Extra Virgin Olive Oil Awards (Referred to as the Oscars of E. V. Olive Oil). Modena Aged Balsamic Vinegar ‘Il Classico’ 8 Years Old (250ml) A rich bouquet and a perfect balance between sweet and sour make this a very versatile balsamic vinegar, made from the best musts and aged for eight years in the barrels of Giusti’s famous cask deposit. With its wonderful perfume, it is a high class choice for salads, omelettes, meat and fish fillets and veal escalopes. Mentioned in the book ‘101 things to buy before you die’ alongside Champagne Krug and Iranian and Belluga Caviar, this vinegar is a twice Gold Medal winner. Hot and spicy Viagro Chilli Infused Oil (100ml) This extra virgin olive oil has been infused with Calabrian chillies and will add a chilli kick to every meal. Known for it's aphrodisiac properties this oil should be used daily - a little goes a long way! Sun Dried Tomato Almond & Pistachio Patè (180g) Sun dried tomato paté with a twist! If you enjoyed our simple sun dried tomato paté we think you will love this! We tried it as a quick and easy pasta sauce – straight from the jar into the pasta and it was delicious! Otherwise, fabulous spread on bruschetta or bread, with or without some creamy cheese! Bronze Die Cut Gragnano Gran Riccioli Pasta (500g) Our IGP (Protected Geographic Denomination) chunky spiral pasta comes from the home of pasta, Gragnano near Naples. It is a great quality product which retains its shape when cooked and tastes great. Tomato Sauce with Porcini Mushrooms (330g) The Porcini mushrooms in this tomato pasta sauce transform it into something really special. This is a healthy sauce, made with San Marzano plum tomato, with a rich, intense flavour – just add it to some Fettuccine or Linguine for a really tasty, memorable dish! Nutty Forest (80g) Exquisite award-winning confectionery from artisan candymakers Lavolio. This keepsake tin contains toasted almonds, pistachios and hazelnuts with chocolate, encased in a crisp sugar shell. All products are carefully wrapped and presented in a lovely 18’’ traditional wicker hamper which is hand-tied with a pretty ribbon. A gift message option is available at the checkout. Please note that if we are out of stock of any item we reserve the right to substitute it with the most similar available item. 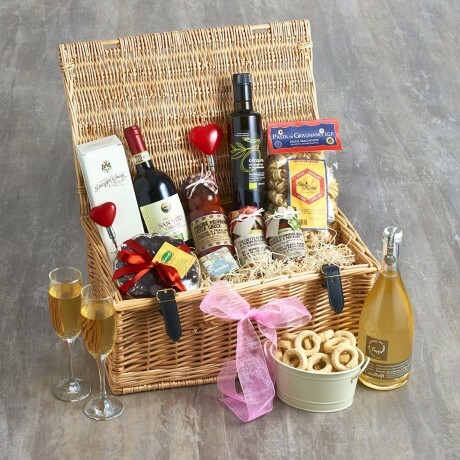 Decorative hearts, Prosecco glasses and taralli dish are not included in the hamper. Allergens: sulphites, gluten, peanuts, sesame, almonds, pistachios, wheat, soybeans. Made in an establishment that also uses nuts, milk, eggs.